I used to wonder if Lego were trying to do slightly too much with the Ninjago range – it’s a construction toy, a trading cards game, a toy spinner, a collectible – and now with the release of LEGO Ninjago Brickmaster, it’s a book as well. But what do I know – the range has become enormously popular. Last term it was the toy of choice to smuggle in to school for every small boy I know. The Brickmaster range from DK is a sort of hybrid – half story book, half Lego building project. The left hand side of the book is a cardboard sleeve containing around 130 Lego bricks, designed to make at least five different models. 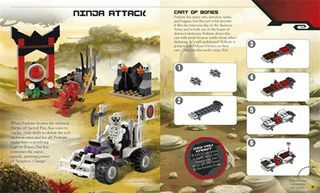 The right hand side is a combination of the sort of Lego instructions you’ll know, but with extra text giving facts about the models and a story involving the escapades of Frakjaw, Skeleton of Fire. So whilst it’s unlikely to win any prizes for literature, it’s a brilliant way to tempt anyone who’s reluctant to read into giving books a try. The child can read through small chunks of text and build the models as they go. A great, fun way to build up reading confidence. My eight year old son enjoyed testing out our preview copy of Ninjago Brickmaster, and was very engaged by the story and building the models. It kept him happily occupied for several days. And I enjoyed the fact that it could all be packed away again in the cardboard sleeve when he was done. This would make a great gift or travel toy.